blog.HalloweenAdventure.com | Latest News from the Costumes Trend FrontLines! : Celebrate the Release of The Dark Knight! Celebrate the Release of The Dark Knight! Celebrate the release of Batman The Dark Knight with our excellent collection of Batman costumes! We’ve got outfits from ever Batman movie ever made, and have a ton of options for those who are into The Dark Knight (and let’s get real, who isn’t?). Read on for the battiest of options! Mimic the great Batman himself in our Batman Collector’s Edition Adult Costume . This full latex costume has sculpted muscle pieces for the perfect look. Costume includes: cape, chest piece, upper arm pieces, gloves with gauntlets, boot covers, upper leg pieces, belt, and cowl. This is an officially licensed Batman™ costume. This costume pays homage to the great Batman, the Batman who’s out to avenge the death of his parents and do it with undeniably human powers. Go against the grain and pick a lesser character to imitate with our Batman Begins Scarecrow Deluxe Movie Costume. 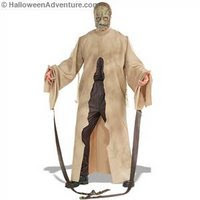 This officially licensed Batman Begins™ deluxe costume includes long robe with attached straps, shirtfront, pants and a character mask. This is a frightening getup, but works perfectly as a duo costume when a friend goes as Batman himself. Go all the way with our Batman Dark Knight Heritage Collection. A pricy piece, but it’s worth every dime. "You wanted me, here I am." Gotham City has seen it’s share of criminals, but nothing like these guys. The Joker and Two-Face are plotting to bring the city down, and there’s only one man that can stop them – Gotham’s favored son – Batman! 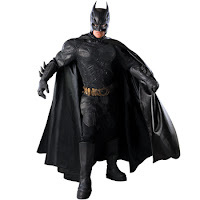 The Batman Dark Knight Batman costume is from the Grand Heritage Collection and includes a black bodysuit to be worn under the molded armor pieces, gauntlets, Batman utility belt, black cape and boot covers. An over-the-head mask with extended neckpiece that can be tucked into the bodysuit is also included to complete this authentic Batman costume. Replicate this summer’s smash hit with our Dark Knight Masks. We’ve got everything from the Joker to the Child Joker! Step aside Batman, there's a new kid in town! 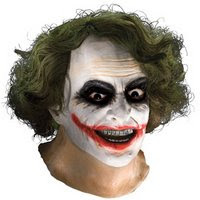 This officially licensed Batman: The Dark Knight Joker mask is made of durable latex and is designed to fit most adults. Now you can wreak havoc on the city in style just like Batman's archenemy! Play for the other side of the team with our Joker Costume. Get serious about Halloween with this cool Joker costume! This officially licensed Batman: The Dark Knight Joker Halloween costume includes the Joker mask and the purple coat with attached, screen printed shirt, vest, and tie combo. Watch out Gotham, things just became a little more complicated! Lastly, try our Batman TV Superhero Costume. This one is a bonafide classic, with its jumpsuit with attached boot tops, headpiece with cape, and belt. This costume guarantees no one will mistake you for any other superhero. Gotham city, look out, ‘cause a hero is on the loose!